Auf der diesjährigen Augmented World Expo sprach Nvidia-Forscher Douglas Lanman über Near-Eye Lichtfeld-Displays, also den Prototypen einer elektronischen Brille, die dem Betrachter sowohl 3D- als auch Tiefendaten vermittelt. Auf die Frage nach Augmented Reality (AR) Anwendungen im Rahmen der Diskussion erklärte Lanman, dass das Design einer transparenten Brille mit Mikrolinsen (oder etwas ähnlichem), die trotzdem auch eine “normale” Sicht ermögliche, eine echte Herausforderung darstelle. Er verwies kurz auf einen anderen Vortrag zum Thema “Pinlight Displays” im Rahmen der selben Konferenz, weitere Informationen im Internet gab es aber nicht. 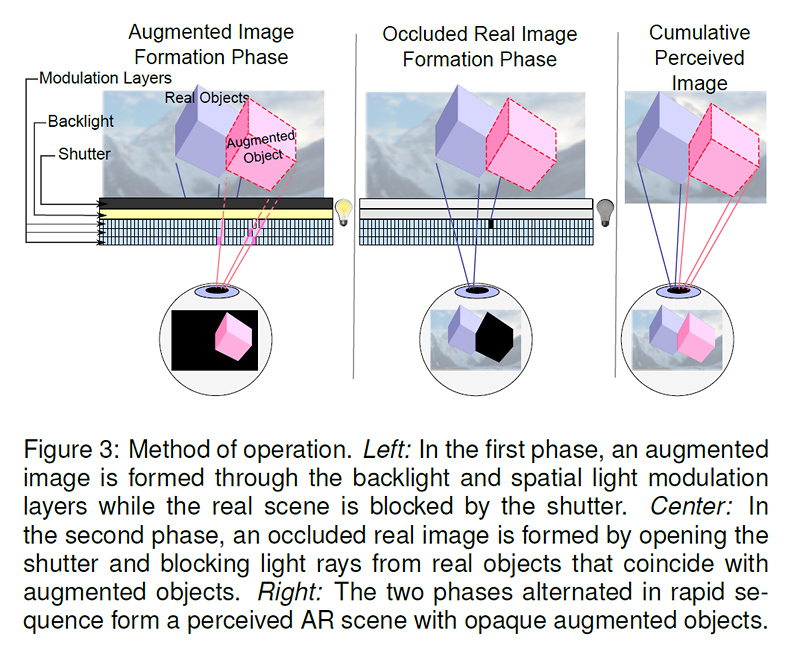 Mit dem Vortrag “Pinlight Displays: Wide-Field-of-View Augmented-Reality Eyeglasses Using Defocused Point-Light Sources” in der Sparte “Emerging Technologies” (entstehende Technologien) der Siggraph 2014 Konferenz (10.-14. August 2014) wollen Adam Maimone und Kollegen von der Universität North Carolina Chapel Hill und aus dem Hause Nvidia jetzt ihre neue Entwicklung vorstellen. Der Abstract der Präsentation, der schon jetzt auf der Siggraph Website verfügbar ist, gibt einige Hinweise darauf, wie das Team um Andrew Maimone die Herausforderung eines Augmented Reality Systems mit 3D-Stereo- und Tiefen-Eindruck löste: Anstatt der Kombination aus LCD und Mikrolinsen im Near-Eye Lichtfeld-Display werden im Pinlight-Prototypen ein konventionelles LCD-Panel und eine Acrylplatte, die als Punkt-Lichtquelle fungiert, dazu genutzt, um dem Auge ein Raster aus Sub-Bildern zu zeigen. This novel design for an optical see-through augmented-reality display offers a wide field of view and supports a compact form factor approaching ordinary eyeglasses. Instead of conventional optics, the design uses only two simple hardware components: an LCD panel and an array of point-light sources (implemented as an edge-lit, etched acrylic sheet) placed directly in front of the eye, out of focus. 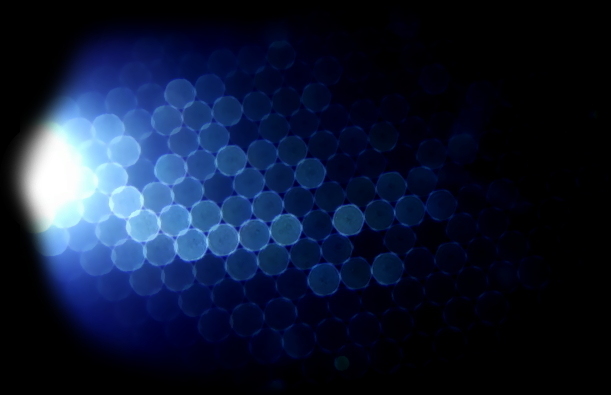 The point-light sources are coded through the LCD to form miniature see-through projectors. A virtual aperture encoded on the LCD allows the projectors to be tiled, creating an arbitrarily wide field of view. Software rearranges the target augmented image into tiled sub-images and sends them to the display, where they appear as the correct image when observed out of the viewer’s accommodation range. Evaluation of the design space of tiled point-light emphasized on increasing spatial resolution through the use of eye tracking and demonstrated a preliminary human-viewable display. Maimone A, Lanman D, Rathinavel K, Keller K, Luebke D, Fuchs H. 2014. 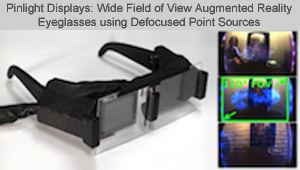 Pinlight Displays: Wide Field of View Augmented-Reality Eyeglasses using Defocused Point Light Sources. ACM Transactions on Graphics (SIGGRAPH 2014). Der Pinlight Display Prototyp basiert anscheinend auf einer vorherigen Arbeit von Andrew Maimone und Henry Fuchs (UNC Chapel Hill): Hier wird ein transparentes, mehrschichtiges Display dazu genutzt, um (1) kodierte Bilder ans Auge zu senden und (2) gleichzeitig eintreffendes Licht “hinter” dem virtuellen Bild zu blockieren. 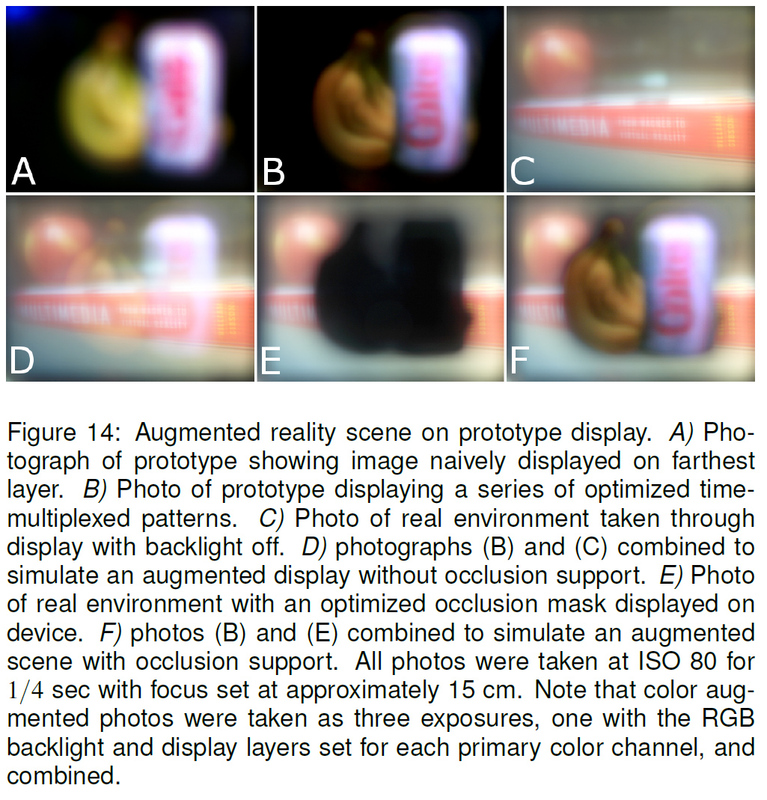 In this paper we discuss the design of an optical see-through head-worn display supporting a wide field of view, selective occlusion, and multiple simultaneous focal depths that can be constructed in a compact eyeglasses-like form factor. 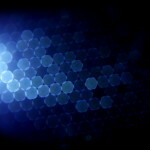 Building on recent developments in multilayer desktop 3D displays, our approach requires no reflective, refractive, or diffractive components, but instead relies on a set of optimized patterns to produce a focused image when displayed on a stack of spatial light modulators positioned closer than the eye accommodation distance. We extend existing multilayer display ray constraint and optimization formulations while also purposing the spatial light modulators both as a display and as a selective occlusion mask. We verify the design on an experimental prototype and discuss challenges to building a practical display. Nähere Informationen: Maimone A, Fuchs H. 2013. Computational Augmented Reality Eyeglasses. IEEE International Symposium on Mixed and Augmented Reality (ISMAR) 2013.